Objective In breast cancers treated with radiotherapy, the epidermis, dermis, and vascular structures are destroyed at the cellular level with inflammatory processes. In this study, it was aimed to evaluate the changes in the skin associated with radiation dermatitis in women with breast cancer. Patients and methods Forty-four women with breast cancer, who received radiation therapy were included in the study. Patient information including the demographic and clinic data were recorded. The field of radiotherapy was evaluated macroscopically and by dermoscopy. Results In 84.1% of the patients, radiodermatitis at a grade of 1 or more was found. In patients to whom a bolus was applied, hyperpigmentation and reticular pigmentation were more frequent but conserved areas were found less frequently. The conserved areas were significantly more frequent in patients with more advanced ages (P=0.038). The patients with visible erythema had multiple milia-like cysts and perifollicular pigmentation on dermoscopic evaluation. Conclusion The use of dermoscopy will provide more information regarding skin toxicity associated with radiotherapy, contributing to the macroscopic evaluation. Treatment for cancer aims to decrease the tumor load or to eliminate it by applying ionizing radiation during radiation therapy. The major limitation in applying radiation therapy is the inflicted injury in the normal tissues . Inflammatory responses are responsible for the early and late adverse effects of the ionizing radiation. DNA damage and cell death cause the release of the inflammatory mediators such as cytokines and chemokines. The resulting inflammatory response is involved in the emerging tissue alterations . Radiodermatitis is common in women receiving radiation therapy due to breast cancer . Although the target is not the skin tissue in the treatment of breast cancer, radiation therapy leads to the devastation of the epidermis, dermis, and the vascular structures at the cellular level . If radiation dermatitis is not well managed, it will create a serious problem for the patient, posing unfavorable effects on the quality of life . Dermoscopy is a noninvasive technique which is used for magnifying and imaging the cutaneous and subcutaneous structures. Dermoscopy was developed primarily for the early diagnosis and treatment monitoring of the malignancies of the skin; however, it has been observed that it is also effective in the evaluation of inflammatory dermatoses . Dermatitis is a well-known side effect of radiation therapy, but the dermoscopic changes caused by radiation have not been demonstrated yet. In this study, the aim was to evaluate the radiation dermatitis-associated changes by macroscopic examination and by dermoscopy, occurring in the skin due to the inflammatory processes emerging in women with breast cancer. The study was approved by the ethics committee of Medical Faculty of Kahramanmaraş Sütçü İmam University (decision date: May 16, 2018, decision no: 7, session: 2018/10). The research was performed in agreement with the Helsinki Declaration and informed consent was obtained from patients for the study. Forty-four women with breast cancer, who received radiation therapy, were included in the study after undergoing mastectomy or breast-conservation surgery. Radiation therapy protocol was applied to the patients as follows: A computed tomography simulation scan of 2.5 mm thickness was performed, using a breast board. The chest wall/breast and the drain site were contoured according to the recommendations provided in the Radiation Therapy Oncology Group Guidelines. Regional lymph nodes were included in the region of interest if required. All patients were given a 50 Gy dose in 2 Gy/fraction. The patients who underwent breast-conservation surgery were given an additional radiation therapy dose of 10 Gy into the lumpectomy site. Bolus was used for obtaining the appropriate dose distribution when required. Radiation therapy was applied using a standard linear accelerator device (Trilogy; Varian Medical Systems, Palo Alto, California, USA) and 6 mV radiography with the three-dimensional field in field-modulated or intensity-modulated radiation therapy technique. The intensity of the emerging radiation dermatitis was graded between 0 and 4 using the Radiation Therapy Oncology Group scoring criteria (0: no reaction; 1: faint erythema, epilation, dry desquamation, diminished sweating; 2: brisk erythema, exudative dermatitis in plaques, and moderate edema; 3: exudative and rough desquamation in regions other than the cutaneous folds and a pitting edema; and 4: ulceration, hemorrhage, and tissue necrosis) . Patient information on the type of surgery, tumor location, the amount of radiation administered by radiation therapy, the emerging grade of radiation dermatitis, and the time elapsed after the radiation dermatitis were collected by reviewing the patient charts. The patients receiving radiation therapy were interviewed on their individual demographic data, disease duration, comorbid systemic and dermatological diseases, and then the collected data were recorded. The area of radiotherapy was evaluated macroscopically. Any loss of hair or presence of hypopigmentation, hyperpigmentation, telangiectasia, atrophy, scar, keloids, nevi, senile angiomas, lentigo, seborrheic keratosis, and skin malignancies were investigated and the findings were recorded. The patients were evaluated with a digital dermoscopy system (Medicam 800 HD; FotoFinder Systems, GmbH, Birbach, Germany). Radiotherapy fields were macroscopically photographed. A 2 cm area (below and above) just around the incision scar was scanned by dermoscopy, assuming to be exposed to the highest dose administered. The dermoscopic image of the specific areas was captured using the contact nonpolarized mode of dermoscope at 20-fold magnification with an immersion liquid. The opposite breast was considered as control of the study and was evaluated dermoscopically. Control area and area around the incision scar were compared. The findings detected by dermoscopic examination that were not in the control area but present in the cancerous breast were recorded and photographed. The SPSS (SPSS Inc, Chicago, Illinois, USA), version 17.0 software package program was used for the statistical evaluation of the data obtained in the study. The continuous data were summarized as means and SDs and the categorical data were summarized as numbers and percentages. The independent ttest was used for the evaluation of the relationship between the two parametric variables in independent groups; the χ2 test was used for the evaluation of the relationship between two categorical variables; and the Pearson correlation test was used for the evaluation of the relationship between two continuous variables. A P value of less than 0.05 was considered to be significant statistically. The mean age of the patients included in the study was 51.82±12.01 (minimum–maximum: 35–83 years). When the occupations of the patients were questioned, it was observed that 88.6% (n=39) were housewives, 9.1% (n=4) were civil servants, and 2.3% (n=1) were blue-collar workers. The mean duration of the disease was 23.8±13.8 months (minimum–maximum: 7–60 months), while 47.7% of the patients had no comorbid diseases; diabetes and hypertension were found out to be the most common comorbid diseases in the study patients. Five (11.4%) patients had hypertension, six (13.6%) patients had diabetes, and five (11.4%) had comorbid diabetes and hypertension. When the presence of other additional dermatologic diseases was questioned, there was a history of pruritus in one (2.3%) patient, photosensitivity in one (2.3%) patient, and allergic contact dermatitis in two (4.5%) patients. Mastectomy was performed in 65.9% (n=29) of the patients and breast-conservation surgery was performed in 34.1% (n=15) of the patients due to breast cancer. Of the patients, 54.6% (n=24) were receiving adjuvant hormonal therapy. The left breast was affected in 56.8% (n=25) of the patients and the right breast was affected in 43.2% (n=19) of the patients. Radiation dermatitis was identified to be of grade 0 in seven (15.9%) patients, grade 1 in 29 (65.9%) patients, grade 2 in seven (15.9%) patients, and grade 3 in one (2.3%) patient. When the time elapsed after the radiation dermatitis was questioned, the mean duration was found to be 16.3±13.6 months (minimum–maximum: 1–48 months). In 17 (38.6%) patients with the macroscopical presence of hair, the mean time elapsed after the radiation dermatitis was 28.5±13.0 months and it was 8.6±6.5 months in 27 (61.4%) patients. The time elapsed after radiation dermatitis in patients with vellus hair in the irradiated field was significantly longer compared with that of patients without vellus hair in the field of irradiation (P=0.000). On macroscopical examination; hyperpigmentation was identified in 79.5% (n=35), dry skin in 38.6% (n=17), fibrotic changes in 18.2% (n=8), telangiectasis in 13.6% (n=6), hypopigmentation in 6.8% (n=3), and atrophic scars in 2.3% (n=1) of the patients. The atrophic scar was identified in the patient who developed grade 3 radiation dermatitis. Neither hypertrophic scars nor keloids were observed in any of the patients. Dry desquamation was found in 11 (25%) patients with a history of grade 1 radiation dermatitis and with elapsed time in a range from 2 to 12 months after the radiation therapy. When the field of the radiation therapy was evaluated in terms of the pigmented lesions, it was found that 11 (25%) patients had senile angiomas, one (2.3%) patient had a nevus, and one (2.3%) patient had lentigo. None of the patients had neither skin malignancies nor seborrheic keratosis in the field of irradiation. 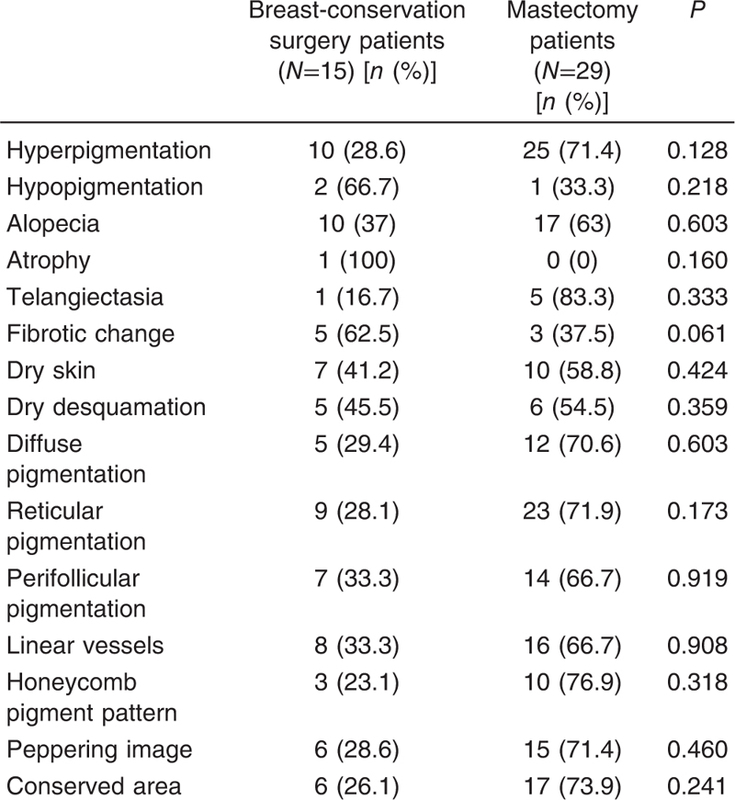 When the patients were evaluated by dermoscopy, reticular pigmentations were found in 72.7% (n=32), linear vessels in 54.5% (n=24), perifollicular hyperpigmentation in 47.7% (n=21), peppering in 47.7% (n=21), diffuse pigmentation 38.6% (n=17), and honeycomb pigment pattern in 29.5% (n=13) of the patients. Dermoscopic examination demonstrated conserved areas in 52.3% of the patients (n=23). When the relationship between the conserved areas and age was evaluated, the mean age of the patients with these areas was 55.4±13.02, while the mean age of the patients without having the conserved areas was 48.0±9.7. The conserved areas were significantly more frequent in patients with more advanced ages (P=0.038). The eight (18.2%) patients with visible erythema had multiple milia-like cysts and perifollicular pigmentation in dermoscopy. Specific findings in dermoscopy in patients who developed radiation dermatitis are presented in [Figure 1]. There was a statistically significant negative correlation between the time elapsed after the radiation therapy and the number of dermoscopic findings (P=0.002, r=−0451). There was no statistically significant difference between the grade of radiation dermatitis and the administered dose of radiation therapy (P=0.494). Macroscopic and dermoscopic findings of the patients with and without bolus application were evaluated. In the group where a bolus was applied, the frequency of hyperpigmentation and reticular pigmentation were statistically significantly higher, whereas the conserved areas were significantly lower (P=0.007, 0.042, and 0.049, respectively). Macroscopic and dermoscopic findings of the patients who underwent a breast-conservation surgery or mastectomy are presented in [Table 1]. The temporal association of the macroscopic and dermoscopic findings in patients is shown in [Table 2]. 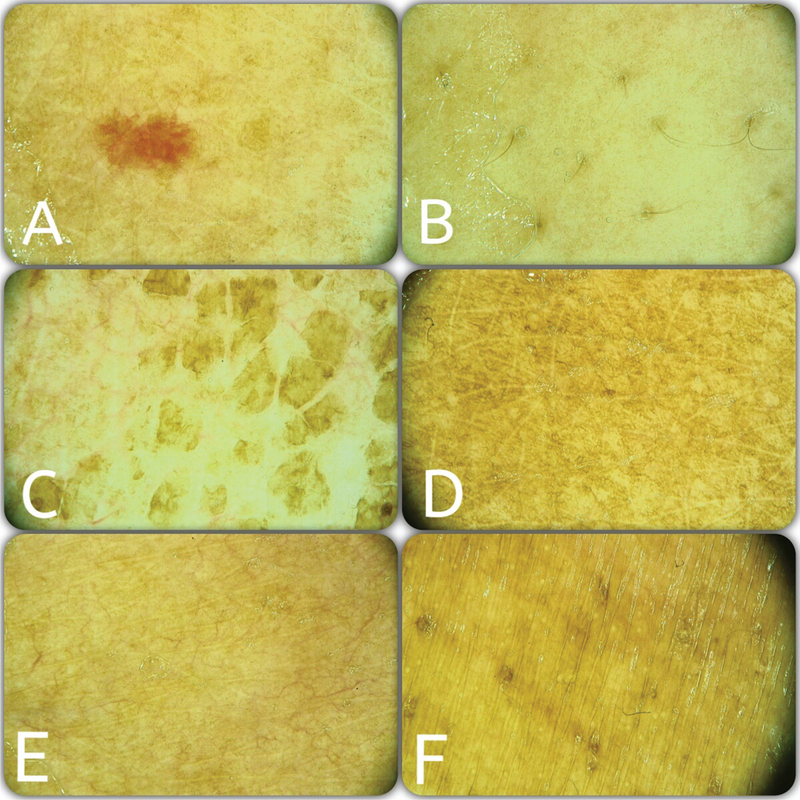 Figure 1 Specific findings in dermoscopy in patients who developed radiation dermatitis. (a) Lacunar structures associated with senile angiomas, the peppering image, and conserved areas. (b) Peppering image and perifollicular hyperpigmentation. (c) Scales of dry desquamation and linear vessels. (d) Conserved areas and honeycomb pigment pattern. (e) conserved areas and linear vessels. (f) Perifollicular hyperpigmentation. Radiation dermatitis develops resulting from the inflicted injuries on the skin structures including the epidermal keratinocytes, dermal fibroblasts, vascular plexus, hair follicles, or eccrine and sebaceous glands . Skin reactions are one of the most common side effects of the radiation therapy and affect 95% of patients . In recent years, the use of modern devices and techniques such as skin intensity and intensity-modulated radiation therapy has reduced the severity of acute radiation dermatitis . In this study, 84.1% of the patients developed radiation dermatitis at grade 1 or above. On the other hand, grade 3 radiation dermatitis was observed only in one (2.3%) patient. In this study, patients with breast cancer were irradiated in multiple fields using the conformal field-in-field technique or using the intensity-modulated radiotherapy. Therefore, the frequency and severity of radiation dermatitis were relatively lower in our study. The invisible erythema stage, in the first 24 h after the exposure to the ionizing radiation, is followed by a stage of visible erythema in a time range from 10 to 14 days to 1 month ,. Following the erythema that develops in the radiotherapy field, the skin color is darkened. The darkening in the skin color is often regressed with the presence of desquamation. Erythema develops due to an increased blood supply through the dermal vascular plexus and dry desquamation develops due to inadequate replication of the basal keratinocytes, which is required for the regeneration of the damaged area . In this study, dry desquamation continued in the first year after the radiation therapy. Furthermore, in eight patients at the visible erythema stage, dermoscopy showed multiple milia-like cysts and perifollicular pigmentation. On the other hand, multiple milia-like cysts disappeared with the regression of erythema. Milium-like cysts represent histopathologically intraepidermal keratin cysts. Dermoscopically, there are many different sizes of white or yellowish round structures . We are of the opinion that these perifollicular pigmentation may be the follicular counterparts of dry desquamation, representing follicular hyperkeratosis. Identification of multiple milia-like cysts in patients with visible erythema demonstrates thair close temporal association with inflammation. The hair roots, eccrine glands, and sebaceous glands are adversely affected in the irradiated skin. The injured sebaceous glands cause dry skin; damage to the follicles leads to alopecia, and migration of the melanocytes leads to hyperpigmentation . Radiation-induced epilation is associated with the high sensitivity of anagen follicles to radiation and is caused due to apoptosis in the follicles . In this study, 61.4% of the patients had no macroscopic examination and 38.6% of the patients described dryness. Along with the increase in the time elapsed after radiotherapy, the frequency of hair detection also increased. Senile angiomas are the most common types of vascular proliferation in the skin . Macroscopic evaluation of the irradiation field showed senile angiomas as the most common pigmented lesions. We are of the opinion that this condition is associated with the composition of the study group, consisting of women at an advanced mean age. Radiotherapy-induced changes in the skin are affected by some factors related to the treatment and to the patient. The type of radiotherapy, the fraction of the dose, and the anatomical field where irradiation is applied are the treatment-associated factors . It is recognized that the dose fraction applied in radiation therapy affects the grade of radiation dermatitis in the early period; however, there is no statistically significant difference between the grade of radiation dermatitis and the administered dose of radiation in this study. This result may be related to the effect of other factors on the grade of radiation dermatitis including the application of a bolus, the age, treatment volume, and the fractionation scale. A study demonstrated that following the irradiation of the breast at a dose of 50 Gy in breast-conservation surgery, there was no significant effect of an additional irradiation at a dose of 10 Gy on the radiotherapy-associated late changes . Similar to the reports in the literature, in terms of macroscopic findings or the findings of dermoscopy in this current study, no significant differences were observed between the mastectomy patients who were administered a relatively lower dose of radiotherapy and the breast-conservation surgery patients who received relatively higher doses of radiotherapy. However, the administration of a bolus was found to have significant effects on some of the skin findings. In the radiation therapy plans, the use of a bolus is a common modality to obtain a uniform dose distribution at the target volume. Bolus directs the entrance dose of the photon beams to the skin surface, allowing to apply a more homogeneous and relatively higher dose of irradiation. A study demonstrated that the use of a bolus was associated with a higher likelihood of acute skin toxicity . In this present study, hyperpigmentation and reticular pigmentation were found at significantly higher rates in the group of patients in which a bolus was used. Surprisingly, the conserved areas invisible in the macroscopic examination were detected significantly at lower rates in the group of patients in which a bolus was not used. 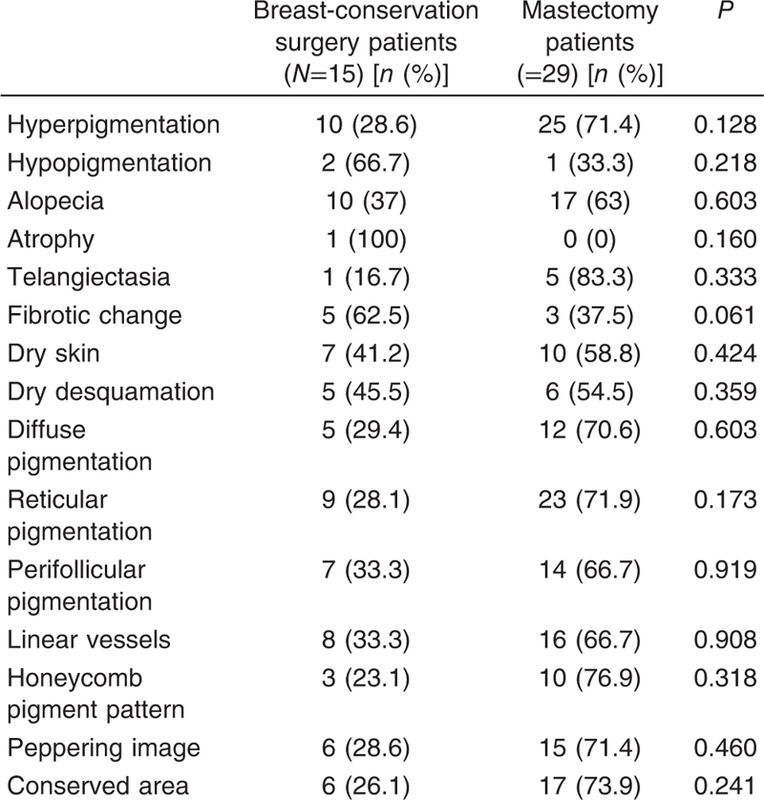 This result supports the knowledge that the application of a bolus contributes to the increased skin toxicity associated with radiotherapy.In this study, the dermoscopic findings of postinflammatory hyperpigmentation showed diffuse, reticular, and perifollicular pigmentation. The image of peppering corresponds to the melanophages in the papillary dermis. They are multiple gray points in a white or hypopigmented area . In almost half of the patients in this study, there was a peppering image. The vessels were linear and irregular. According to the time elapsed after radiotherapy, it was found that alopecia, dry desquamation, perifollicular pigmentation, linear vessels, and conserved areas were observed in the first year; however, fibrotic changes and honeycomb pigment pattern were detected after the first year at significantly higher rates. The reduction in the number and function of fibroblasts in the dermis during the aging process causes a reduced synthesis of collagen and elastin, leading to a thin, loose, and wrinkled skin. On the other hand, the reduction in the subepidermal fat tissue enhances wrinkling and sagging of the skin . In this present study, we found that conserved areas were seen more frequently in older ages. We think that these areas, which cannot be detected by macroscopic evaluation, correspond to the grooves forming the skin lines. The synthesis of collagen and elastin is known to be modulated by estrogen . The reduced amounts of estrogen parallel to the increasing age along with the adjuvant hormonal therapy used for the treatment of breast cancer may contribute to the loss of skin elasticity. Radiation dermatitis is a common side effect frequently encountered in patients receiving radiotherapy. In this study, the most common macroscopic findings were hyperpigmentation, alopecia, dry skin, and dry desquamation. The most frequent dermoscopic findings were reticular pigmentation, linear vessels, perifollicular pigmentation, images of peppering, and honeycomb pigment pattern. Other than the visible changes, dermoscopy drew attention to other findings including the conserved areas, perifollicular pigmentation, inflammation-associated multiple milia-like cysts, and irregular linear vessels. Furthermore, dermoscopy also provided information on the components of pigmentation. Dermoscopy can be a practical, noninvasive, and an advanced alternative diagnostic technique potentially useful in the evaluation of radiation therapy-associated skin injuries. The lack of evaluation of the study area before radiotherapy is the limitation of our study. Maillot O, Leduc N, Atallah V, Escarmant P, Petit A, Belhomme S et al. Evaluation of acute skin toxicity of breast radiotherapy using thermography: results of a prospectivesingle-centretrial. Cancer Radiother 2018; 22:205–210. Najafi M, Motevaseli E, Shirazi A, Geraily G, Rezaeyan A, Norouzi F et al. Mechanisms of inflammatory responses to radiation and normal tissues toxicity: clinical implications. Int J Radiat Biol 2018; 94:335–356. Beamer LC, Grant M. Longitudinal trends in skin-relatedand global qualityof life among women with breast radiodermatitis: a pilot study. Eur J Oncol Nurs 2018; 33:22–27. Singh M, Alavi A, Wong R, Akita S. Radiodermatitis: a review of our current understanding. Am J Clin Dermatol 2016; 17:277–292. Seité S, Bensadoun RJ, Mazer JM. Prevention and treatment of acute and chronic radiodermatitis. BreastCancer 2017; 9:551–557. Cook LC, Hanna C, Foulke GT, Seiverling EV. Dermoscopy in the diagnosis of inflammatory dermatoses: systematic review findings reported for psoriasis, lupus, and lichen planus. J Clin Aesthet Dermatol 2018; 11:41–42. Malkinson FD, Hanson WR. Physiology, biochemistry, and molecular biology of the skin. Oxford: Oxford UniversityPress; 1991. Ryan JL. Ionizing radiation: the good, the bad, and the ugly. J Invest Dermatol 2012; 132:985–993. Simonen P, Hamilton C, Ferguson S, Ostwald P, O’Brien M, O’Brien P et al. Do inflammatory processes contribute to radiation induced erythema observed in the skin of humans? Radiother Oncol 1998; 46:73–82. Schmuth M, Sztankay A, Weinlich G, Linder DM, Wimmer MA, Fritsch PO et al. Permeability barrier function of skin exposed to ionizing radiation. Arch Dermatol 2001; 137:1019–1023. Glover D, Harmer V. Radiotherapy-induced skin reactions: assessment and management. Br J Nurs 2014; 23:30–35. Özdemir F, Karaarslan IK, Türk BG, Şahin S, Şahin MT, Oğuz O et al. Interpratation and adaptation of dermoscopic terminology to our language: consensus report of the Turkish Society of Dermatology Dermoscopy WorkingGroup. Turk J Dermatol 2013; 7:206–235. Sekiguchi K, Ogita M, Akahane K, Haga C, Ito R, Arai S et al. Randomized, prospective assessment of moisturizer efficacy for the treatment of radiation dermatitis following radiotherapy after breast-conserving surgery. Jpn J Clin Oncol 2015; 45:1146–1153. Nakayama F, Hagiwara A, Kimura M, Akashi M, Imamura T. Evaluation of radiation-induced hair follicle apoptosis in mice and the preventive effects of fibroblast growth factor-1. Exp Dermatol 2009; 18:889–892. Robati RM, Ghasemi-Pour M. Efficacy and safety of cryotherapy vs. electrosurgery in the treatment of cherry angioma. J Eur Acad Dermatol Venereol 2018; 32:e361–e363. Barnett GC, West CM, Dunning AM, Elliott PM, Coles CE, Pharoah PD et al. Normal tissue reactions to radiotherapy: towards tailoring treatment dose by genotype. Nat Rev Cancer 2009; 9:134–142. Okumura S, Mitsumori M, Kokubo M, Yamauchi C, Kawamura S, Oya N et al. Late skin and subcutaneous soft tissue changes after 10-Gy boost for breast conserving therapy. Breast Cancer 2003; 10:129–133. Abel S, Renz P, Trombetta M, Cowher M, DayWerts E, Julian TB et al. Local failure and acute radiodermatological toxicity in patients undergoing radiationtherapy with and without postmastectomy chest wallbolus: is bolus ever necessary? Pract Radiat Oncol 2017; 7:167–172. Verma SB. Dermatology for the elderly: an Indian perspective. Clin Dermatol 2011; 29:91–96. Aytekin S. Skin Symptoms in Menopausal Period. Turk Klin J Dermatol 2002; 12:222–224.